"User Expectations in Intelligent Environments". 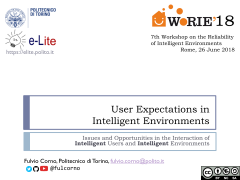 this was the topic addressed by Fulvio Corno in his keynote speech opening the 7th International Workshop on the Reliability of Intelligent Environments (WoRIE 2018), exploring Issues and Opportunities in the Interaction of Intelligent Users and Intelligent Environments. 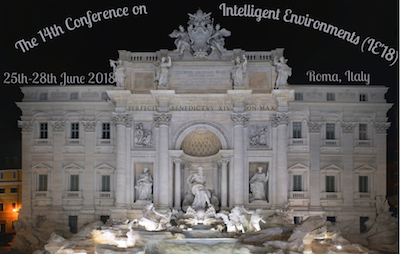 The talk analyze the differences between the expectations that end-users have from Intelligent Environments (that are well capture by the IE manifestos and seminal papers), comparing them with the actual content of the research papers published in the international journals of this research community. 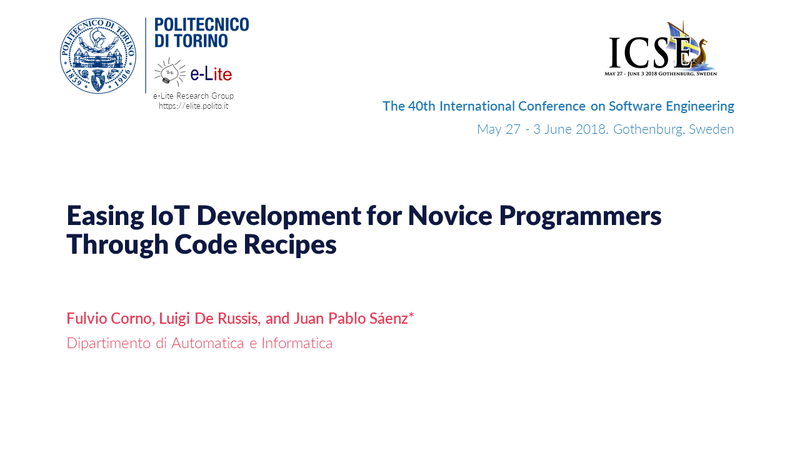 The e-Lite research group will partecipate at the 42th IEEE International Conference on Computers, Software, and Applications (COMPSAC 2018), to be held in Tokyo (Japan), from the 23th to the 27th of July 2018. The conference, organized by the IEEE Computer Society, focuses on different aspects of computer science and engineering and it is organized in 10 symposia, ranging from Computing Education to Software Engineering, to Computer Architecture and Data Science. 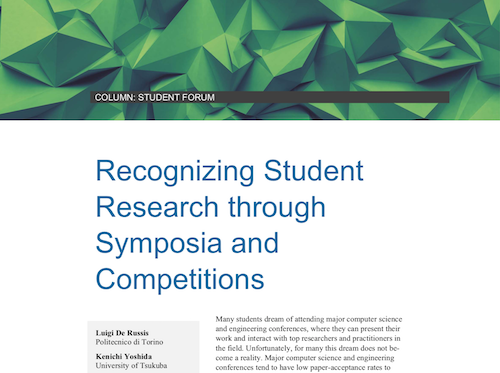 The latest number of the IEEE IT Professional magazine (May/June 2018) features an invited paper on "Recognizing Student Research through Symposia and Competitions" for its Student Forum colum. The article proposes a reflection upon the role and attendance of students at scientific conferences, especially in computer science and engineering. In fact, most major computer science and engineering conferences have low paper-acceptance rates also to maintain high-quality presentations and results, and dedicated funds for student attendance are often limited. However, student participation in conferences is important as they are the next generation of researchers. To overcome this issue, more conferences are organizing student-related activities, such as student research symposia and competitions. Do you have intense feelings that your achievements are undeserved? 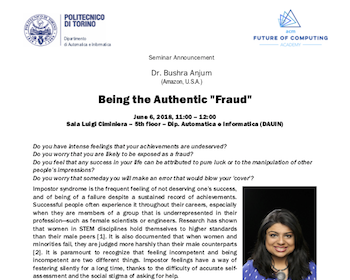 Do you worry that you are likely to be exposed as a fraud? Do you feel that any success in your life can be attributed to pure luck or to the manipulation of other people's impressions? Do you worry that someday you will make an error that would blow your 'cover'? Impostor syndrome is the frequent feeling of not deserving one’s success, and of being of a failure despite a sustained record of achievements. Successful people often experience it throughout their careers, especially when they are members of a group that is underrepresented in their profession - such as female scientists or engineers. Research has shown that women in STEM disciplines hold themselves to higher standards than their male peers. It is also documented that when women and minorities fail, they are judged more harshly than their male counterparts. It is paramount to recognize that feeling incompetent and being incompetent are two different things. Impostor feelings have a way of festering silently for a long time, thanks to the difficulty of accurate self- assessment and the social stigma of asking for help.